Deepika Padukone and Ranveer Singh star-studded Mumbai reception, which took place on 1 December saw a number of Bollywood A-listers in attendance, including Shah Rukh Khan, Kareena Kapoor Khan Katrina Kaif, Amitabh Bachchan, Rani Mukerji, Anushka Sharma, Varun Dhawan and Karan Johar. The occasion also formed perfect ground for industry reunions. Now, a post by Madhuri Dixit-Nene is making netizens reminisce about Sanjay Leela Bhansali's 2002 film Devdas. In the Instagram picture, Madhuri is seen alongside the director and Shah Rukh Khan, who played the titular character in the film. Dixit essayed the role of Chandramukhi, an empathetic courtesan who eventually falls in love with Devdas. She captioned the picture as as "My favourites in a single frame." Shah Rukh Khan is currently involved in the post-production of Aanand L Rai's ambitious film Zero, slated to hit the theatres on 21 December. The film also stars Anushka Sharma and Katrina Kaif in lead roles. 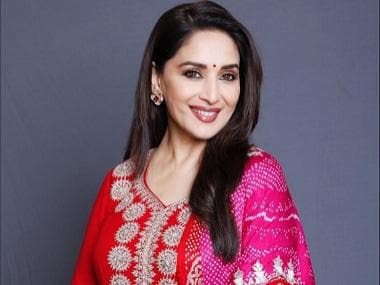 On the other hand, Madhuri will be next seen in Abhishek Varman's upcoming directorial, Kalank where she will be sharing screen space with Sanjay Dutt after 21 years.